For the last few days we have been making our way up the Mofia cost of Italy, along the French Rivera, and through the foot hills of the French Alps towards our first stop. While the first large mountain we’ll be climbing is Mont Blanc, we need time for our bodies to acclimatize to the high altitude. 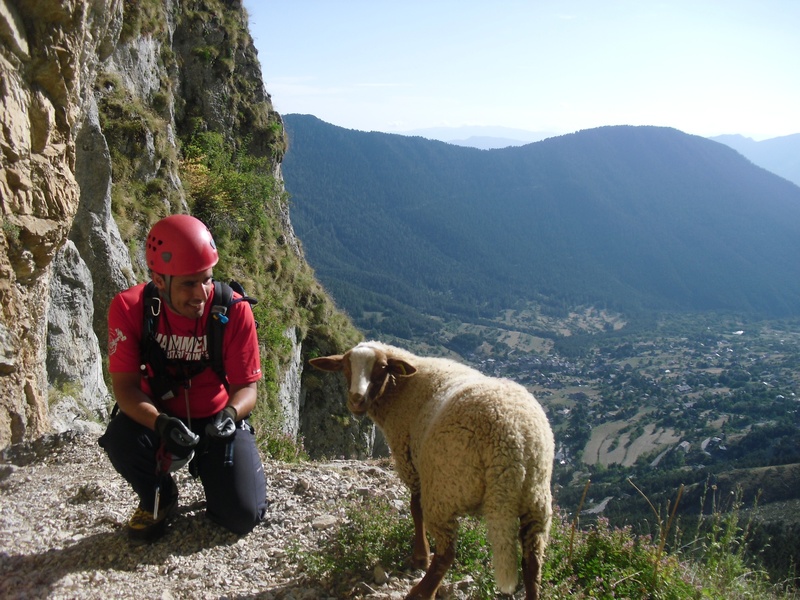 To help accomplish this, we will be climbing a Via Ferrata route in the Parc National Mercantour (VIA FERRATA du BAUS DE LA FREMA, COLMIANE, ALPES MARITIME, FRANCE). This will give us some entertainment, a little exercise and most importantly a chance to acclimate to the altitude in the mountains. A via ferrata (Italian for “road with irons”) is a mountain route which is equipped with fixed cables, ladders, and bridges. 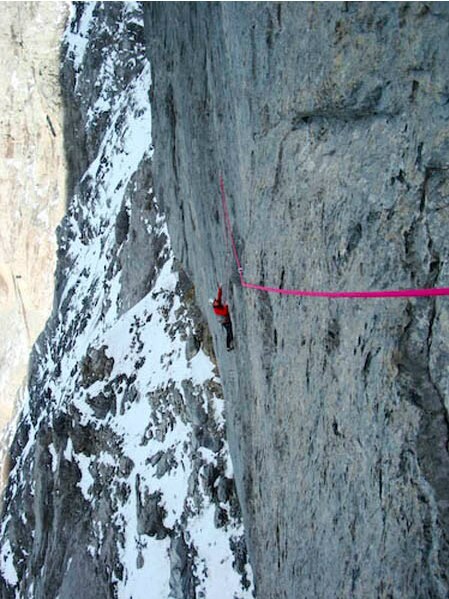 Climbers can follow via ferrate without needing to use their own ropes as they can clip into the protective cables that follow along the route. 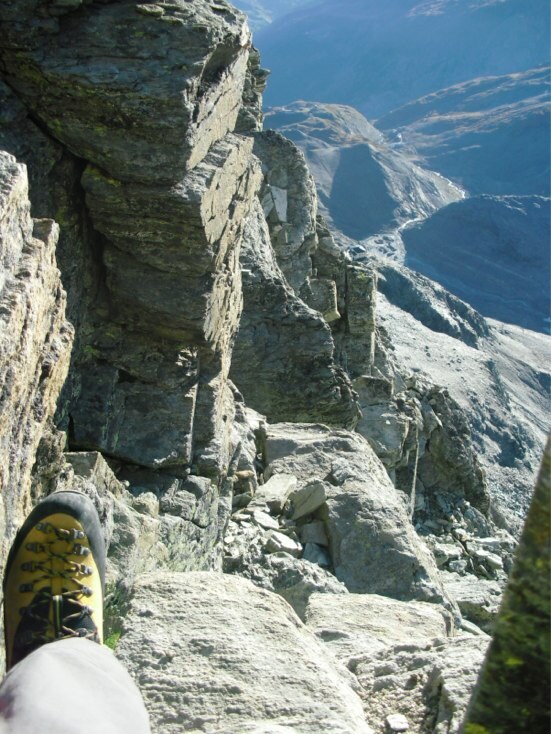 The first via ferrate were built in the Dolomite mountain region of Italy during the First World War, to aid the movement of the Italian mountain infantry, but today these kind of routes exist in mountain ranges throughout Europe and are a great recreational activity for the vertically inclined adventurer in all of us. After a fun day of Via Ferrata climbing in the French Alps, we’ll return to our hotel and begin preparations for a day of canyoning in one of only two locations in Europe that provide this type of sporting activity. Stay tuned for a post and pictures of today’s Via Ferratta climb. 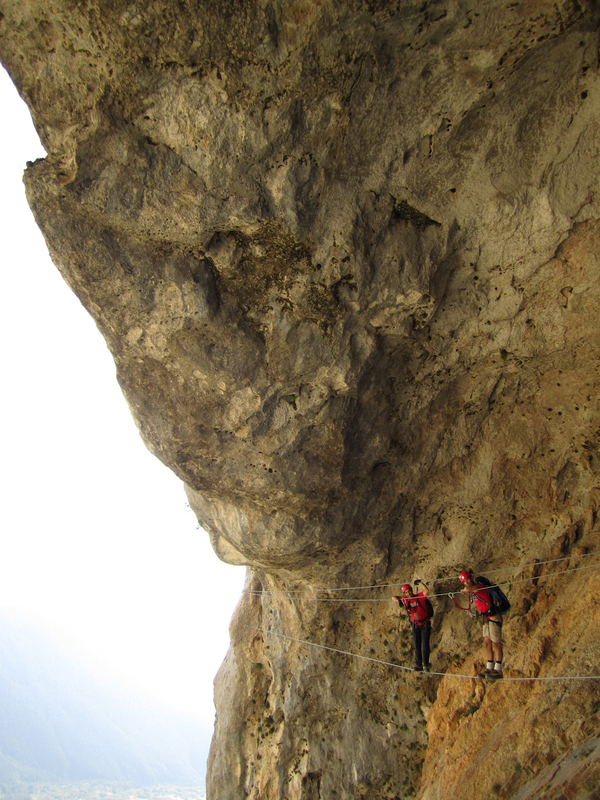 The “La Colmaine”Via Ferrata climb has been a gripping experience. We were blessed by the joining of two friends on the climb, Heather Drew (Carl’s wife), and Drew Weiland (a recent friend). During the climb we were able to begin acclimatizing, but it also served as a great exercise in teamwork, trust in our equipment and dealing with exposure to great heights. All of which will be crucial during our attempts to summit the big mountains we will be tackling in next days to come. The route was a NOT for the faint of heart. 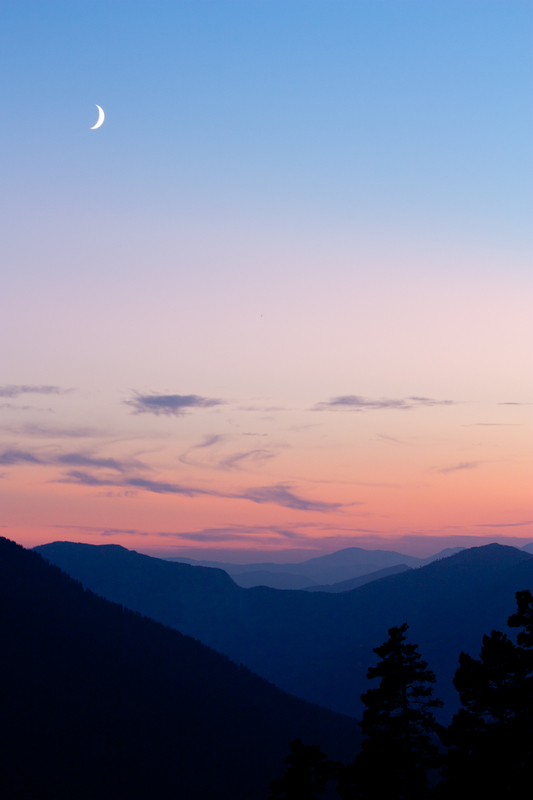 The route begins at about 5,500 feet above sea level and reaches a summit of about 7,000 feet. We found ourselves constantly switching between: scaling and traversing shear cliffs, walking across tight ropes that spanned 150 feet between cliff faces, and crossing swinging bridges suspended between rock spires. At times a single foot hold made of a ½” rebar and a one hand grip onto small cracks in the rock was what held us onto shear cliffs that towered more than 500 feet above the bolder strewn valley below us. Despite our having safety harness and being clipped into the route, it did not take a lot of mental energy to imagine how catastrophic a fall from this height would be. Yet, among all the vertical fears we knew the most important factors were focusing on the next move, our team mates, and trusting in our equipment. We also noted the value of taking a break from focusing on the fear and the goal of moving forward, so that we could take in the amazing beauty of the sights that surrounded us. At one point during the climb we joined by a special mountain friend, Billy. He kept things very entertaining; he took a special liking to Carl and followed him closely for quite a while. We’re still not sure on who is the better climber, Carl or Billy the mountain goat, but apparently goats are not that good at crossing tight wires, so we were eventually able to leave him behind. It was a bittersweet departing, but we felt good knowing we didn’t have to be embarrassed knowing that a goat could do everything we were doing. With a 1 hours decent from our high point, we found ourselves arriving in the parking lot as the sun was setting… and off to the east we were able to see one of the most beautiful moon crescents any of us have ever seen. 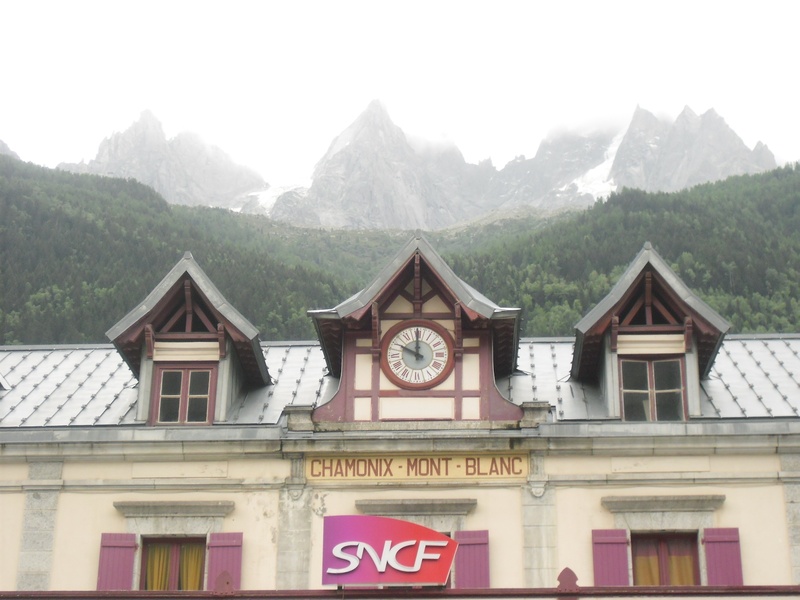 After TWO separate 27 EURO fees to cross a bridge, then use a tunnel, we arrived in Chamonix, France today. It’s a gorgeous little town in a valley between several mountains in the area. 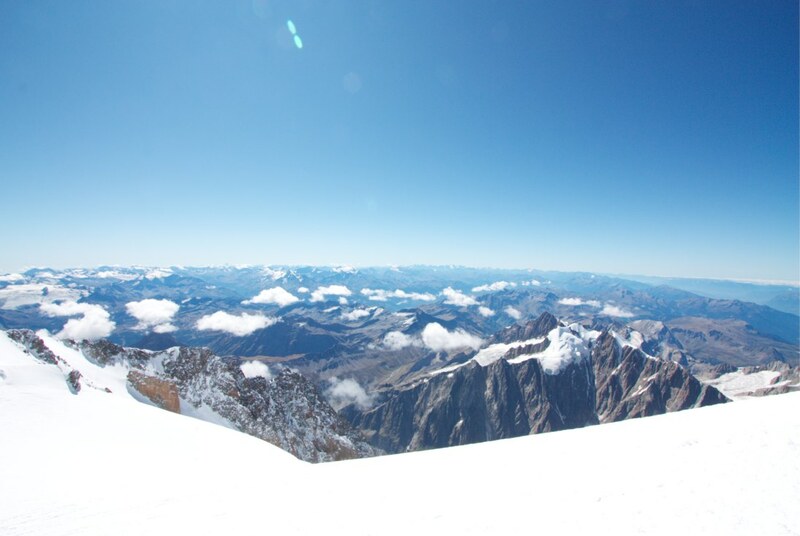 Most notably, it’s one of two cities that climbers use to access the Mont Blanc routes (the other is in Italy). The “information center” didn’t seem too friendly, the local climbing store didn’t seem to have a very good grip on english and the local climbers we talked to seemed to have slightly different information than the shops. There WAS however one thing that everyone seemed to agree on: The Gouter Route (which is what we had charted out, learned and planned on taking) was not safe do to excessive rock fall. 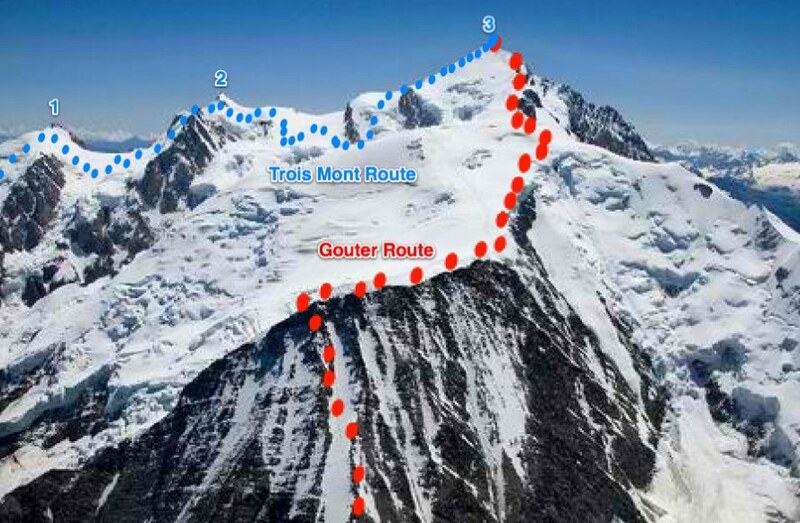 In short, the Gouter Route is the most travelled route and also the most balanced. 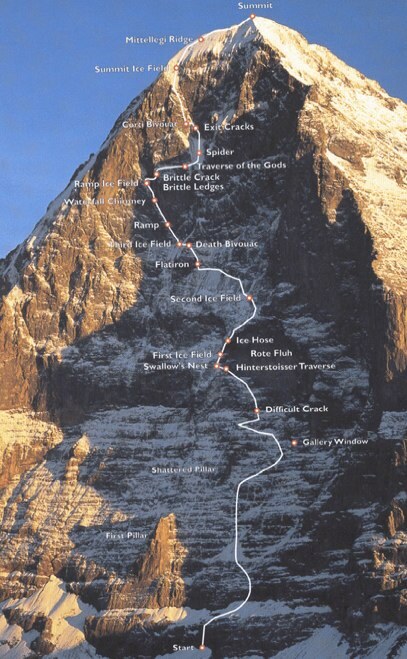 Essentially, there is a hut midway through the route which allows you to have two equally long days of climbing. But because of the lack of snow this year, the rock on the route has become less stable and has resulted in more rock fall than usual. 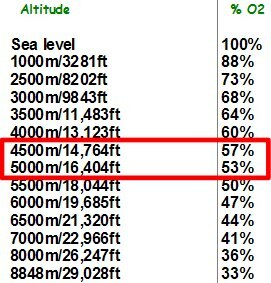 After looking at the first 100 meters of the Three Mont Route, my lack of mountain climbing experience set in. Specifically, I had never worn crampons before. Walking out on this ridge with a pair of heavy metal spikes strapped to my boots seemed like an absurd idea. In fact, before I knew it was the entrance to the route I told Carl that only crazy people would walk on that ridge. With the weather conditions being poor on the mountain and my lack of experience, we decided to spend some time training on a glacier at roughly 6,000 ft (“Mer de Glace”). The city of Mont Blanc spends a great deal of time maintaining an ice cave that has been dug into a hole in the glacier, but what was of interest to us was the surface above the cave. I’ll tell you this – walking on ice with giant spikes metal spikes strapped to your feet takes some getting used to. Un. Comfort. Able. But INCREDIBLY valuable. I had a chance to walk some extremely narrow ridges (all solid ice), climb up some near vertical walls with only my ice ax and crampons and jump across crevasses. 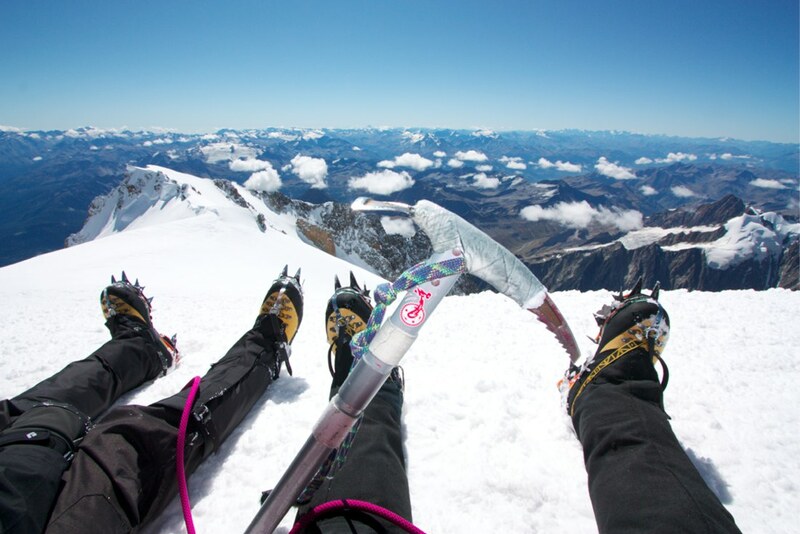 From a mountaineers perspective, this is all very mellow activity – but certainly not for the faint of heart. 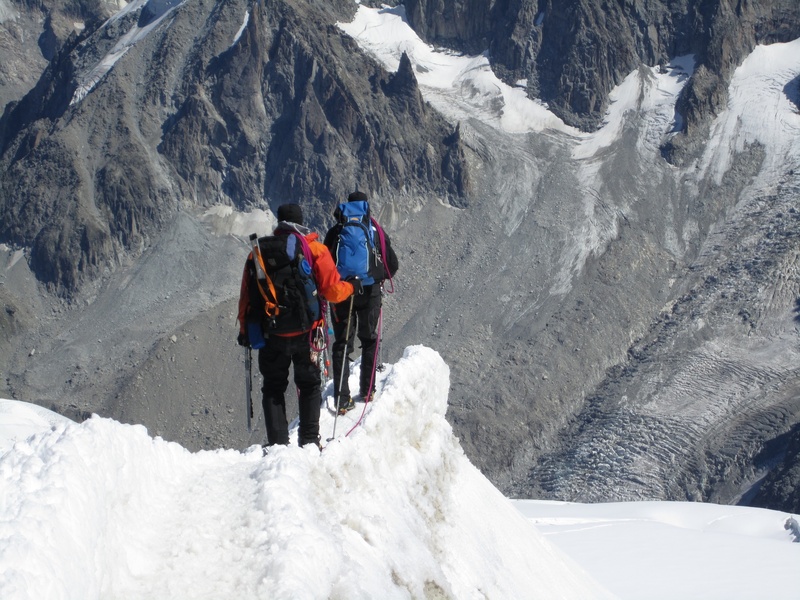 Simply the approach and exit to the glacier presented some problems for a novice mountaineer. There was not a clear cut path to get on the glacier so the first step was to find an access point. Once we did, the only way down to the ice was to slide down 20 feet of rock to a small foot hold, then slide the remaining 20-30 feet to the boulder below (which sits next to the glacier). While the ice presented great lessons and practice for our journey, our trip back to Chamonix should not be ignored. The only exit to the Glacier (unless you have a 20 foot vertical jump) was to climb up what can only be described as an unsupported via ferrata. There are a series of ladders, tiny metal foot platforms and rungs that take people up the side of a very steep mountain to a train back to Chamonix. Today was the first of many days we will be spending at high altitude. 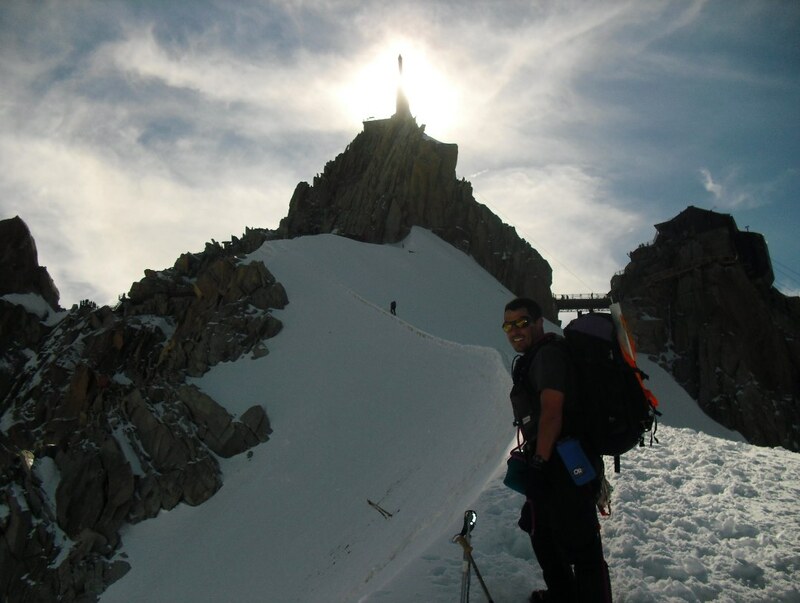 Today we spent roughly 7 hours hiking behind L’Aguille du Midi – the highest point a lift will take you (12,000 feet). The weather still isn’t good enough to safely ascend Mont Blanc so our top priority is getting acclimatized for the inevitable ascent. Midi Aside from spending our first significant chunk of time in high altitude, we also accomplished a few other goals… Brad had a chance to get some more experience with being exposed on the mountain – as I think he mentioned, the entrance to the Three Mont Route does not allow a missed step. He definitely took a few steps in the right direction as far as getting more comfortable with the exposure on the mountain is concerned. Because of the length of the Three Mont Route (potentially 13-18 hours), it’s incredibly important to utilize every minute we can to push the climb forward. With the first lift headed up to L’Aguille du Midi at 8:10AM and the last lift coming down at 5:30PM (only about a 9 hour gap), it’s important that we sleep on the mountain the night before the climb. 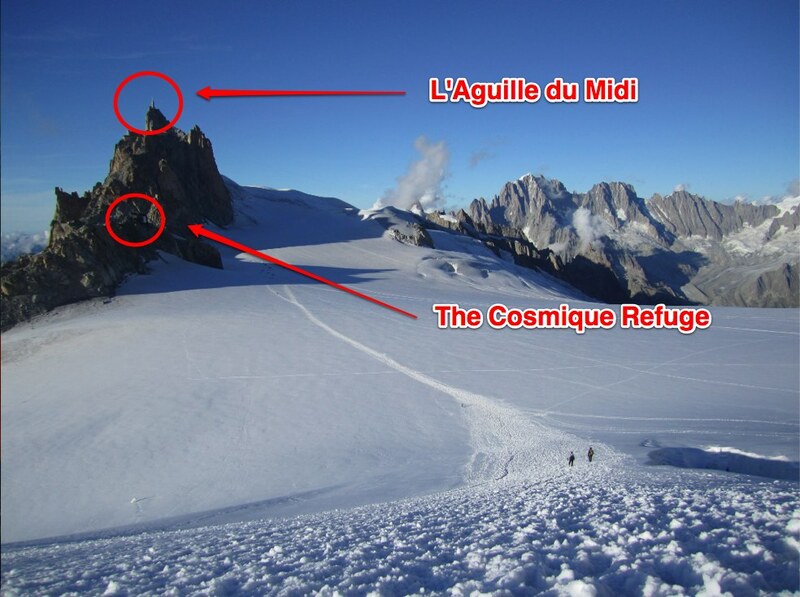 There are two options for this; camping on a glacier or the Cosmique Refuge. Unfortunately we have heard that the refuse is often full. The Cosmique Refuge is a little over an hour hike from L’Aguille du Midi, so we hoofed it on over to look into the sleeping arrangements. As it turns out, they have pretty nice accommodations for a 12,000 ft hut. They provide a meal at night and a breakfast at 1AM, 3AM or 5AM (though we’re not quite sure what kind of food we would be eating). 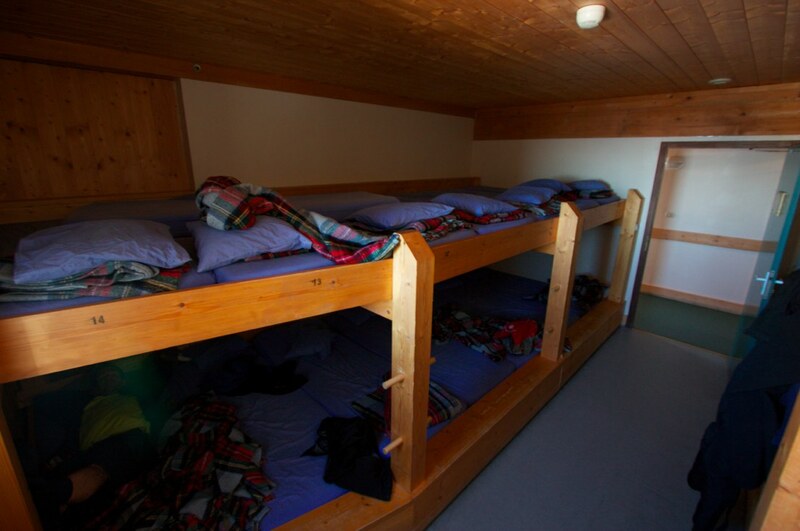 The rooms hold “group bunk beds” with single foam mattresses all lined up next to each other and a blanket and pillow is provided for those who are lucky enough to get a reservation. 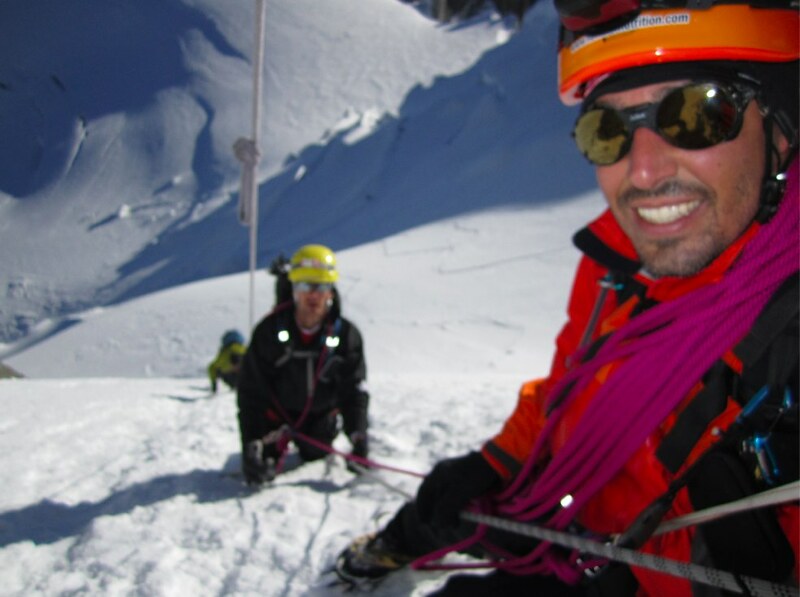 Today we put the final touches on preparing our gear for the Mont Blanc climb. While it is critical to have warm enough clothing, adequate water and back up safety measures for a high altitude climb, those are also the items that add weight to your pack. With several hours added to our journey, the less weight we have to carry, the better. Every extra layer, change of socks, underwear and tool that we carry adds weight to an already heavy bag that we need to carry up three mountains. 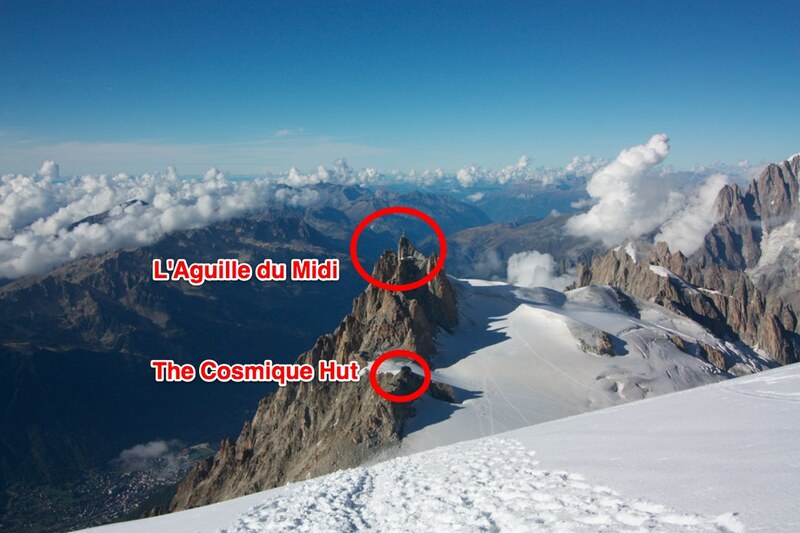 Unfortunately, the wind is expected to be equally strong tomorrow – AND – the Cosmique hut is already booked for the next four nights. Our window of opportunity is closing. After talking to locals, IF the lift is open tomorrow or the next day, that leaves us with two options: camping in the snow for the night at 12,000 feet or sleeping in the bathroom at that last cable car stop – L’Aigille du Midi. After a few grateful hours of sleep and a traditional french breakfast (7am breakfast for us), we left The Cosmique Refuge, hiked the ridge to L’Aguille du Midi and took a tram back to our friends and family in Chamonix. A shower, toothpaste and real food never felt so good. Carl and I were both happy to finish such a long climb. After a couple hours of rest and relaxation with Heather and Drew, we started on our journey to the next mountain: The Matterhorn. 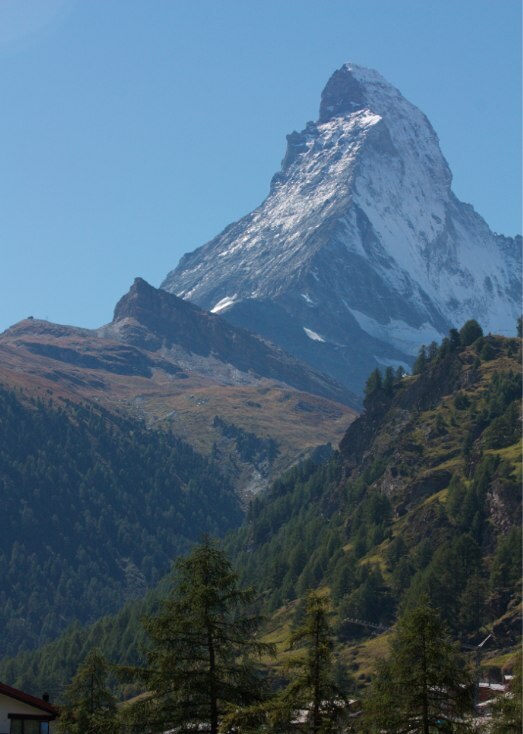 The Matterhorn is one of the most iconic mountains in Europe, and is located in Zermatt, Switzerland. 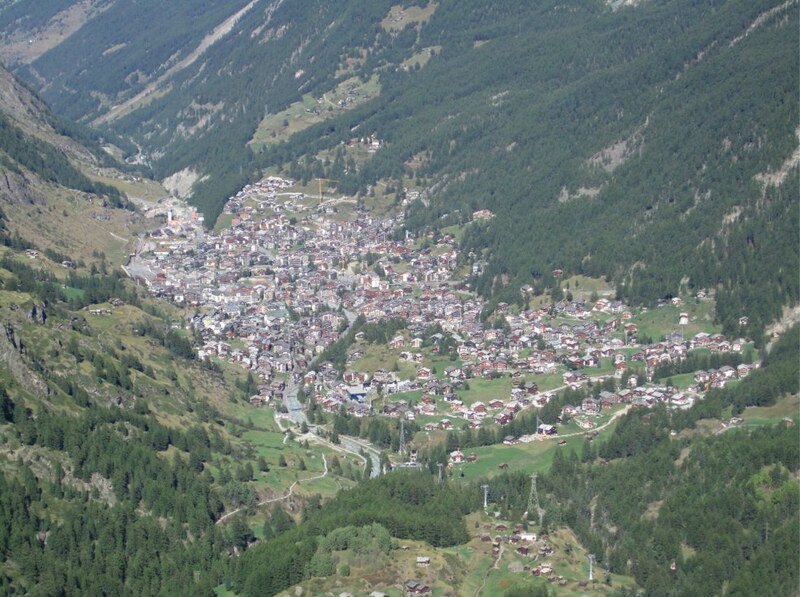 Zermatt is was first identified on a map in 1495, but was thought to be settled many years before. 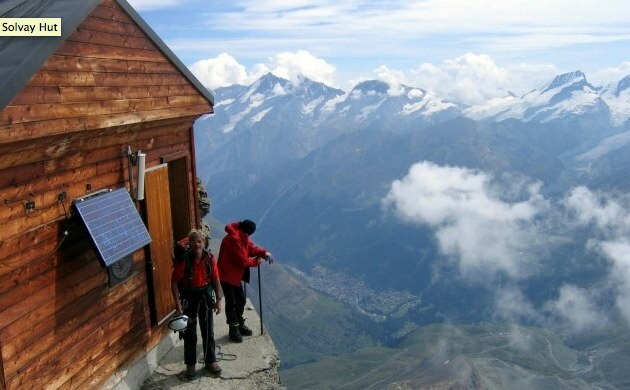 One of the particularly interesting facts about Zermatt: No road leads there. 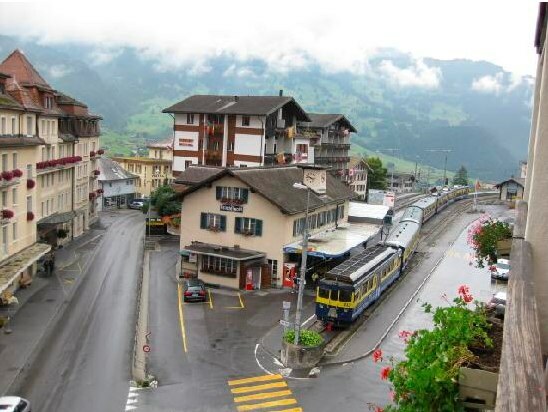 The closest you can get is a town by the name of “Tasch”, where you must take a train in to Zermatt. 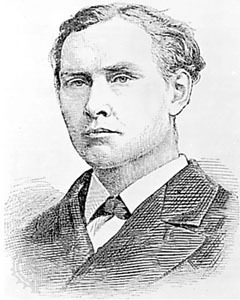 The Matterhorn itself was first summited by Ed Whimper inn 1859… half his team didn’t make it down alive after the first successful summit. After the train ride in, Carl grabbed my arm and we quickly embarked on our explorative mission: setting the stage for our next climb. We needed to know weather conditions, the gear needed, the suggested route, cable car and train schedules to get the highest point on the mountain and refuge lodging accommodations. Unfortunately, there’s no “one stop shop” for this. After talking to the people at The Zermatt Information Center and several climbers in a variety of climbing stores, we felt like we had a decent grip on the “lay of the land”. Despite differences in personal skill, each person we talked to echoed the same thoughts: As long as you stay on the route, you’ll be fine with the the gear you have. Carl Drew is one of the most planned, well though out, prepared people you’ll ever meet in your life. We have all the gear you could possibly need. 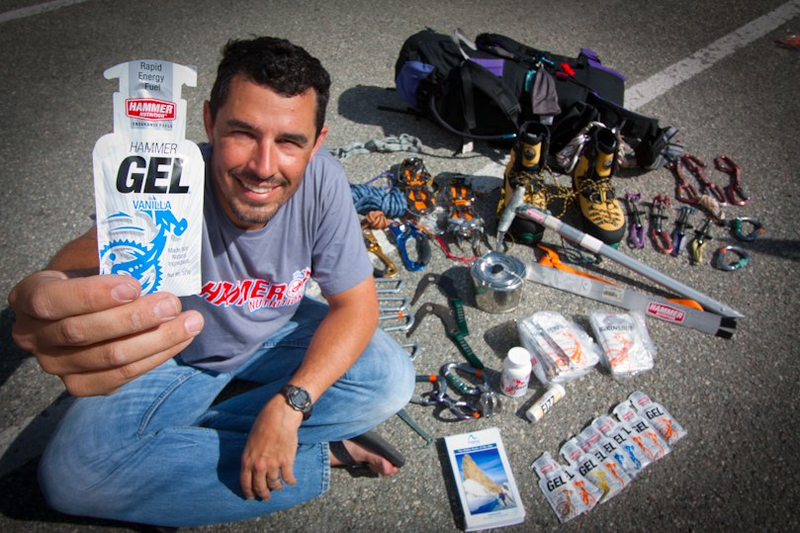 Carl was pretty clear on the gear we’d need – but what neither of us was clear on: How much rope we’d need. 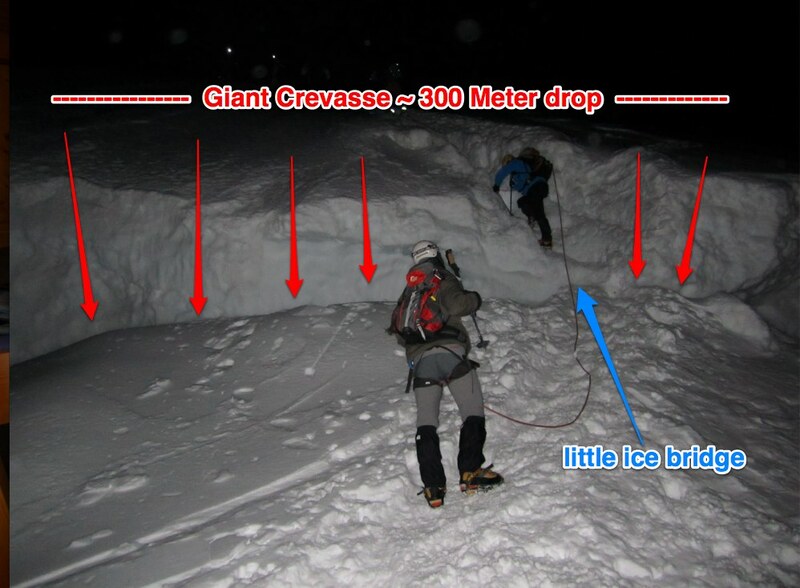 The significant threat on Mont Blanc was falling into Crevasses. 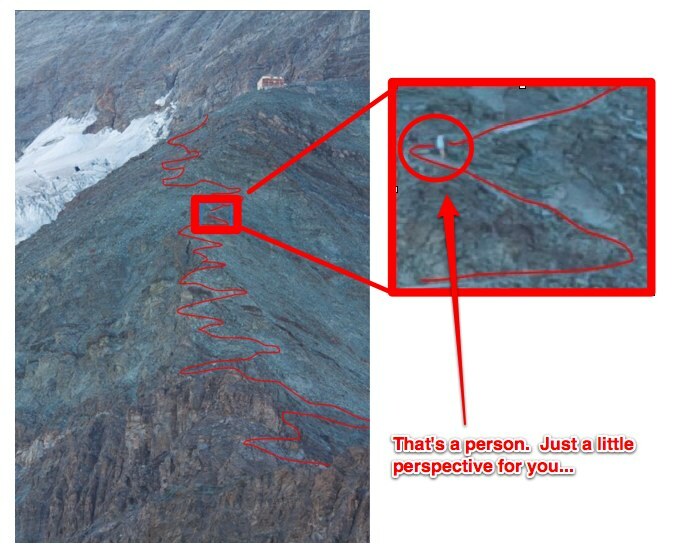 Of course there was some threat of falling off a ledge or sliding down a several thousand foot slope – but the most significant danger were the apparent and hidden crevasses. 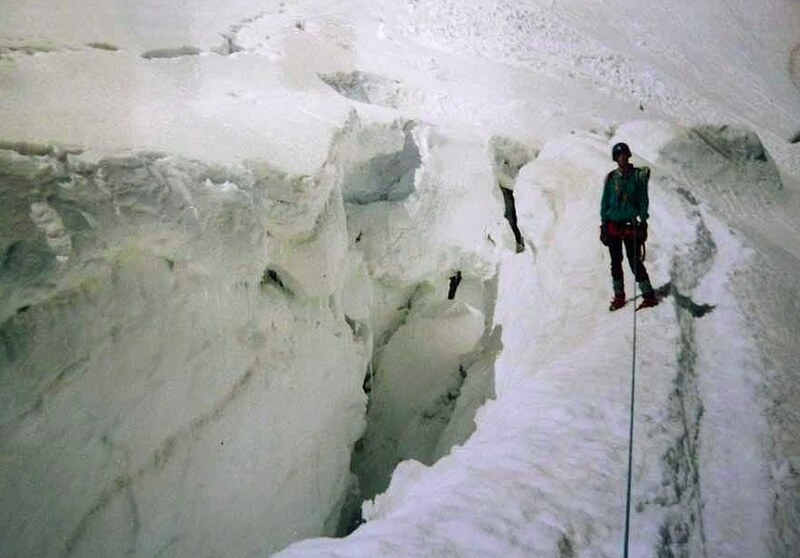 The goal in this environment is to keep enough rope between you to allow time to react if someone falls, but not so much that they could hit the bottom or a crevasse if they fall. 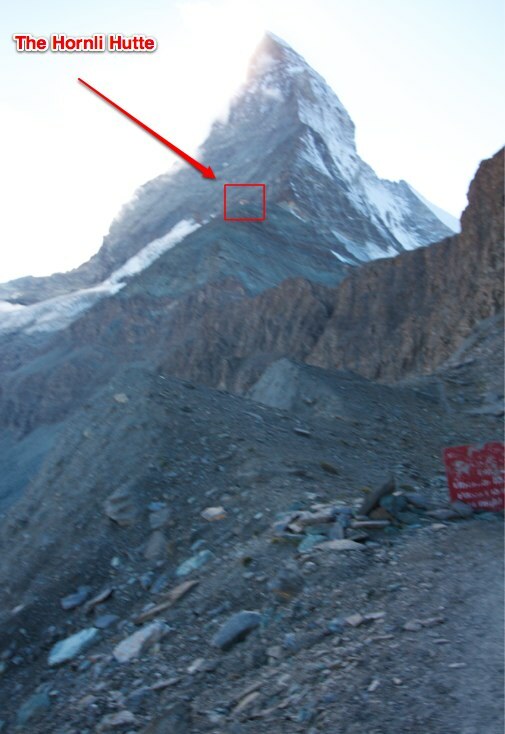 The significant threat on The Matterhorn is falling off a the mountain. 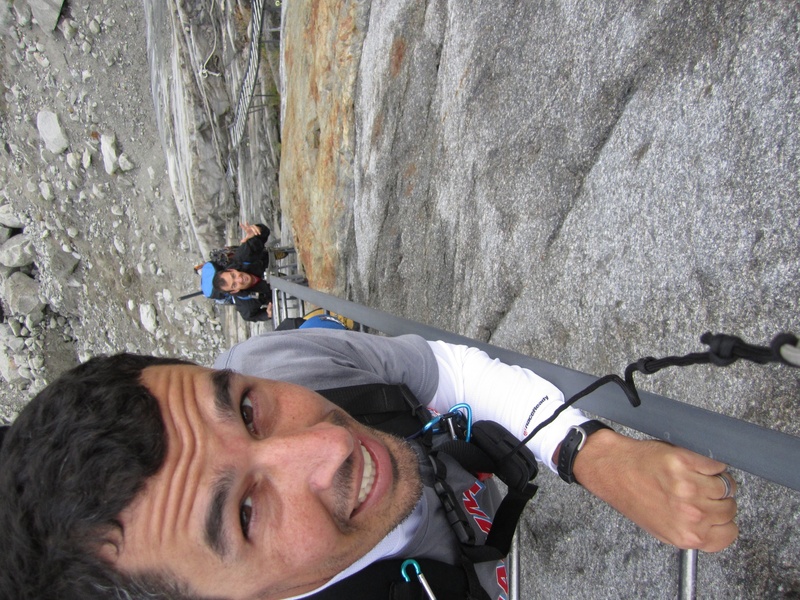 No crevasses, no snow, just unstable rocks, unsecured movements and very, very step ledges. 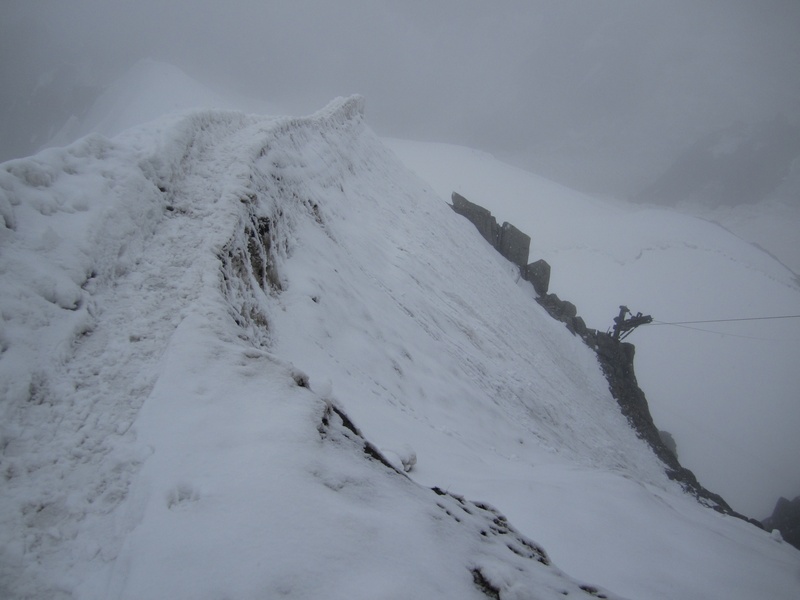 This was a threat while climbing – but is considered a much larger threat during the decent from the summit. The likelihood of slipping and falling is much higher when you can’t see the footing below you. 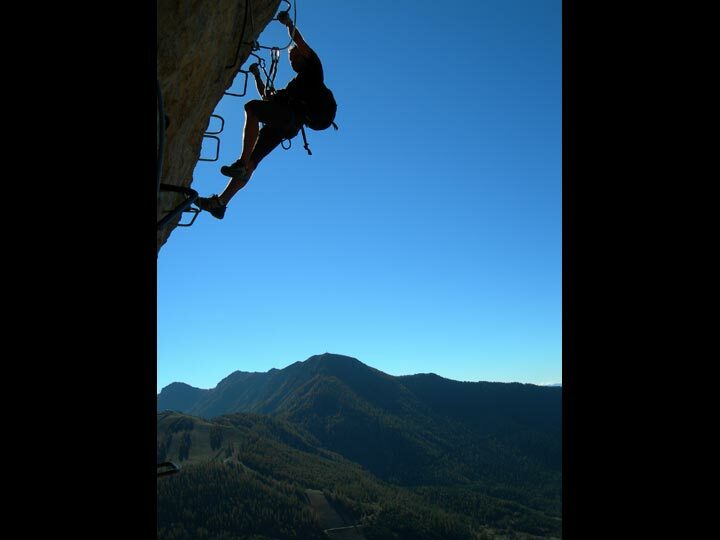 If your rope is too short – you may not be able to lower your partner to the ledge below you while descending. We own – and have been using a 30 meter rope up until this point. The only time we could have used a longer rope thus far was during the Mont Maudit decent. But in Zermatt, EVERY person we talked to addressed this specifically: 30 meters should be fine, IF you stay on route. The implication: if you get off route, you won’t be able to get down with a a rope that length. 1) We needed a longer rope. 2) The route was not easy to follow. 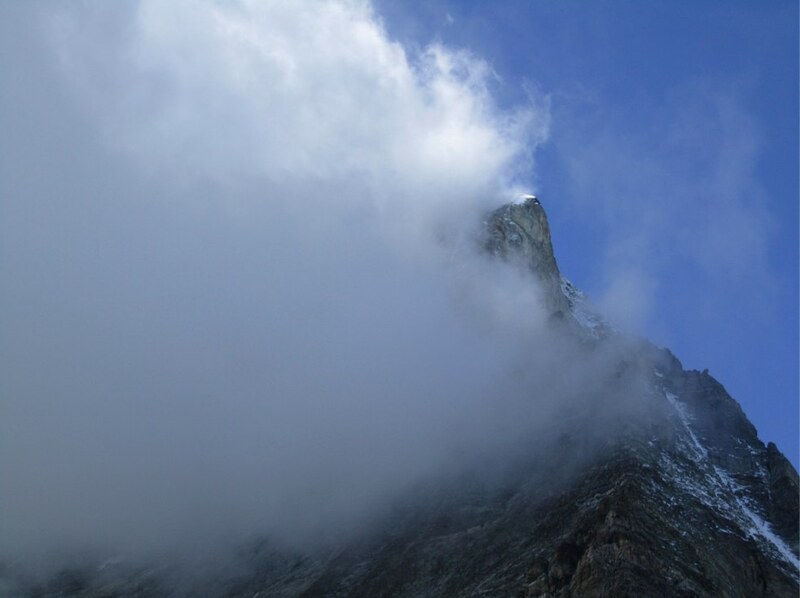 As with any climb, the weather plays a huge role when attempting The Matterhorn. This particular mountain is unusually dangerous after snow or rain. There is very little security as you climb – a small slip could have a fatal result. Unfortunately our arrival to Zermatt was met with a viscous thunder storm – which meant snow and ice on the mountain. Our hope is that after a couple days of sunshine the mountain will be in good enough condition to climb safely. The weather forecast in Zermatt looked good after the storm. With a couple days of sunshine, the majority of the snow and ice on The Matterhorn should have melted off, offering a relatively safe route up the mountain. 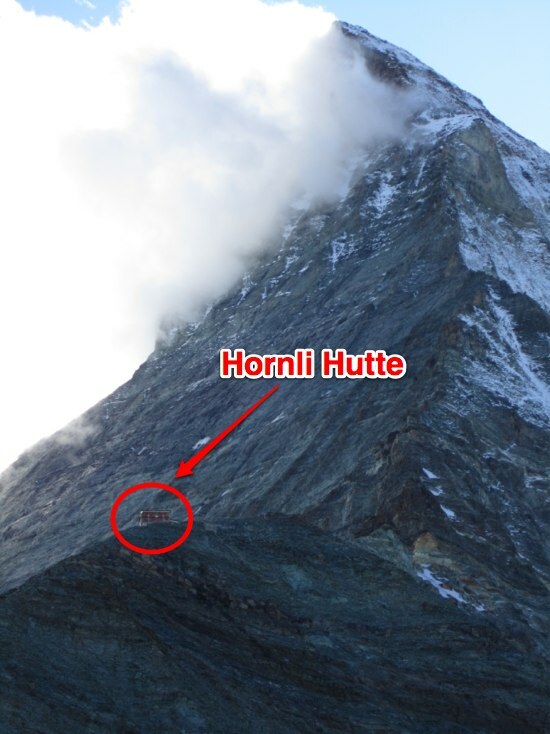 With this in mind, we booked two nights at the the refuge at the based of the mountain; The “Hornli Hutte”. As with Mont Blanc, our plan was to sleep at the refuge the night before, wake up very early the next day and head for the summit. We unpacked, organized and repacked all of our gear, xeroxed our route from a guide book and headed off to the lift. 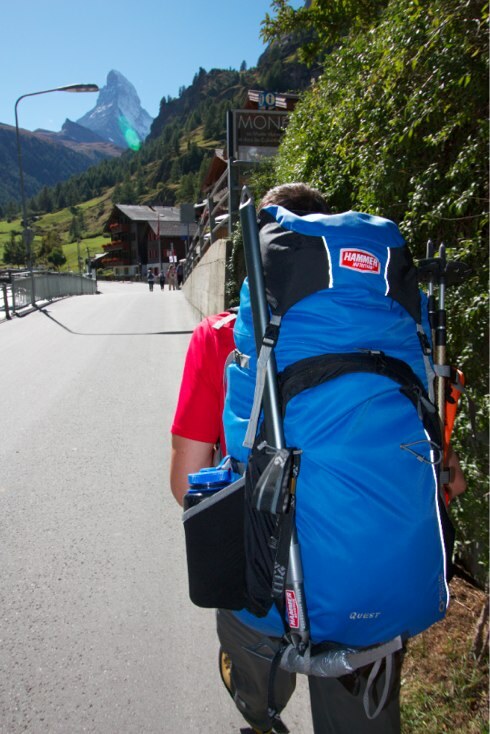 We weren’t entirely sure what equipment we’d need on the mountain, so we brought EVERYTHING with us. Worst case scenario we could leave things at the refuge – but at least we’d be prepared. But that just bumped up the weight of our packs again. 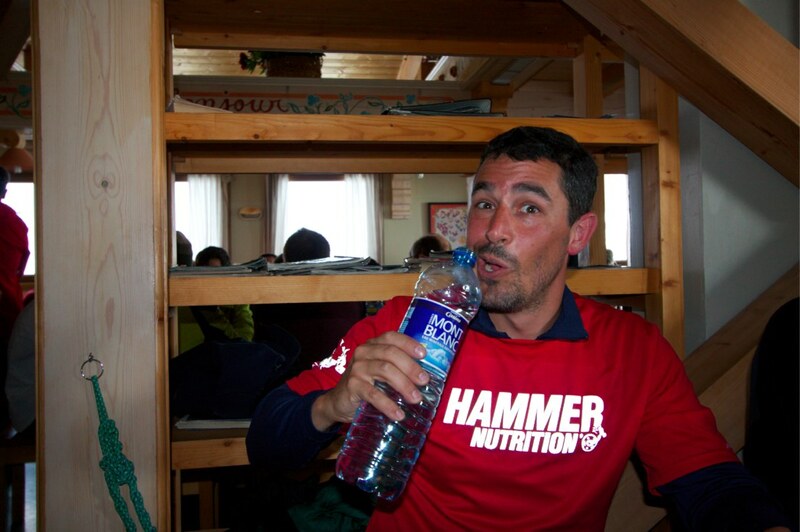 What we WERE certain of was the exact amount of Hammer Gel, and Hammer Nutrition fuel we would need. This is a staple in our diet while climbing. From the city of Zermatt, we had to take two cable cars and then hike half day hike to get to the Hornli Hutte. Our last minute packing left us running to catch the last cable car with our now VERY heavy backpacks and boots on. With the time on our trip running out and uncertain weather conditions, this was our one and only chance to climb the Matterhorn. Fortunately we are fairly well acclimatized at this point, so the 6,000 ft elevation of Zermatt didn’t slow us down too much. 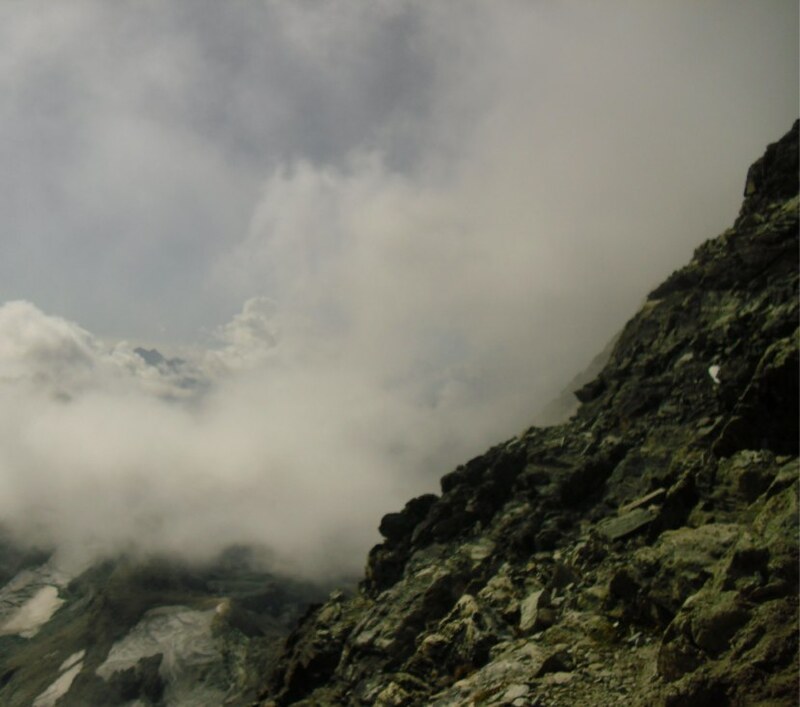 While being acclimatized is nice – the “little” half day hike up the Hornli Hutte was far from pleasant. Between the obnoxious weight of our bags and the pitch of the route, the journey to the hut alone felt like an adventure. 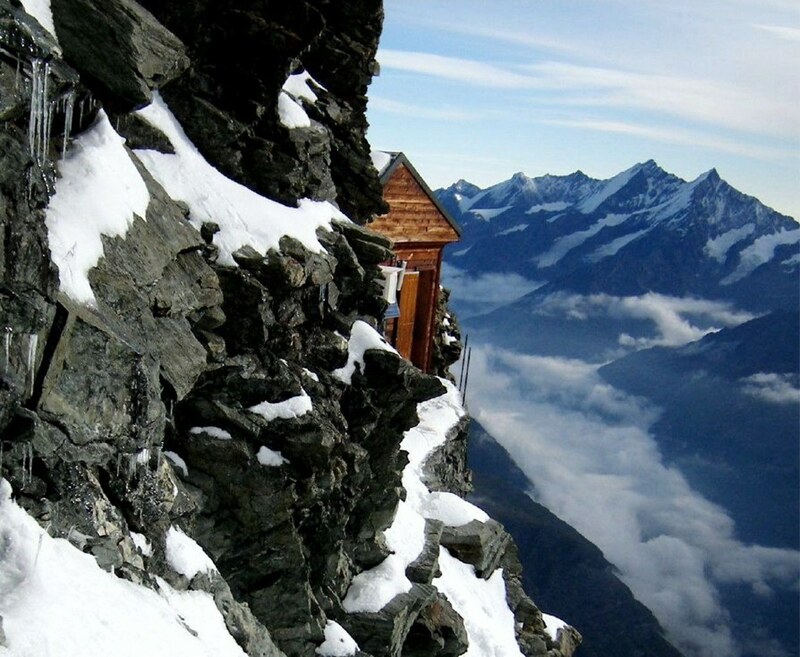 The accommodations at the Hornli Hutte was a few steps down from the Cosmique Refuge. There was one toilet on each floor, no running water and no heat. Of course, what we were most concerned with was certainly a bed to sleep in and a good starting point for the climb – which the hut certainly provided. 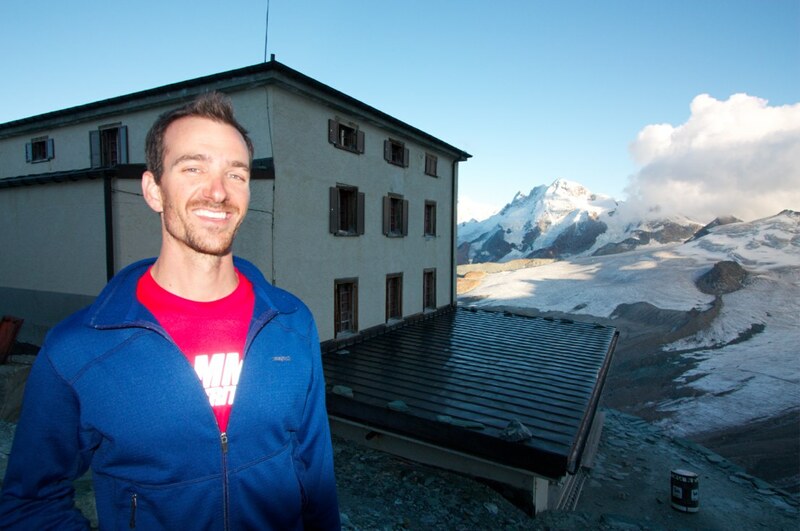 In addition to the extravagant accommodations, the hut offered some good conversation with fellow climbers. We met a couple climbers from Holland who clearly had experience and some insight on the route. With their guidance, we paired our backpacks down to nearly nothing. Before the end of the day my pack was locked and loaded with no more than my ax, emergency kit, very long rope, fuel and water. We packed a number of carabiners and slings on our harnesses as well, but it was roughly 20% of the gear we hauled up to the Hut. We went to bed at 8PM that night – aiming for a solid 7-8 hours of sleep. Going to bed early was a good idea… But that’s all it was. Neither Carl or I slept for more than 15 minutes at the Hornli Hutte. We both laid there for 7 hours – but neither of us slept. The refuge was very cold, I was tight from the journey up the hut and while I wasn’t gasping for air, periodic deep breaths through the night were necessary due to the altitude. Carl and I got up at 4:45 to get a jump on the other climbers. Unfortunately, quite a few others had the same idea. 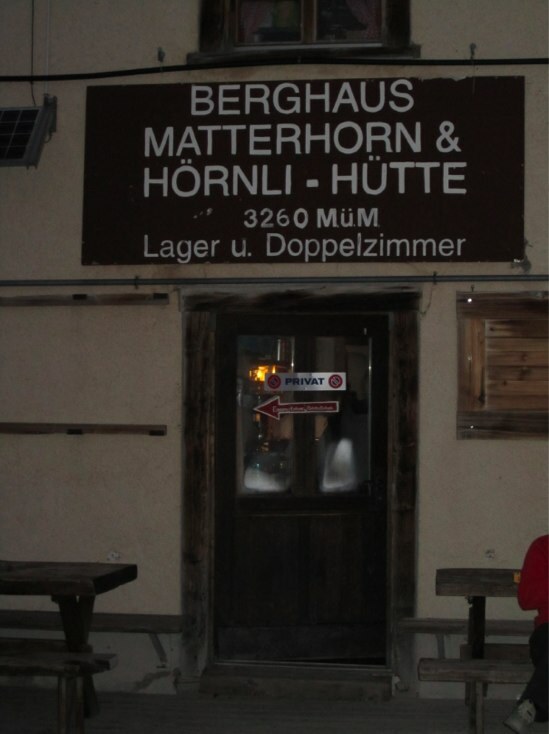 In addition, The Hornli Hutte has a strange rule: Nobody is allowed to leave the hut until 5:20AM. There was literally a line of climbers and guides standing at the door at 5AM waiting to leave. While climbing Mont Blanc, the Cosmique Refuge had a reasonable french breakfast (toast, cereal, croissants, nutella, jam and coffee). There was a VERY limited breakfast at the Hornli Hutte. There were 15 tables on the main floor of the hut, but only 6 of them were set with silverware. 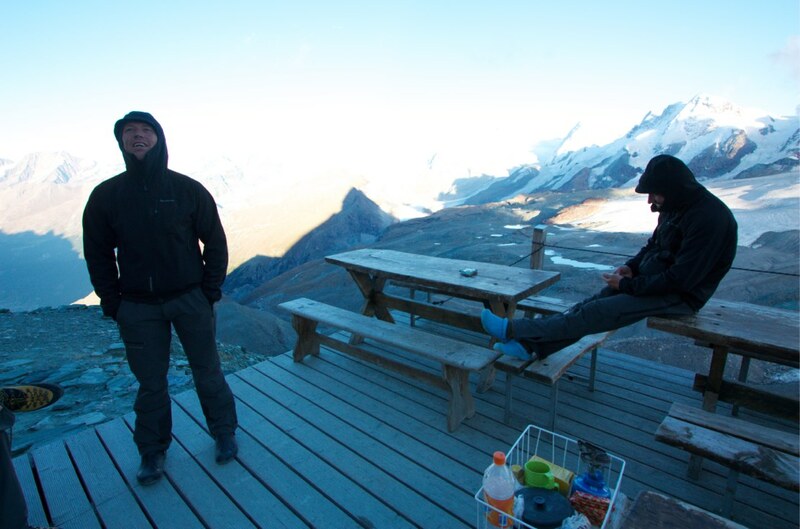 On each of the 6 tables there was a basket of bread and a jar of jam… no coffee, no tea, no service and 65 climbers. We were almost completely dressed and prepared to leave by 5:15 – but had no sleep and nothing to eat. While I struggled to come to peace with the idea of many many hours of climbing with no food (we weren’t the first ones downstairs), we had one priority: We NEEDED to follow the group to know where we were going -The single loudest piece of advice we hear: the route is very, very difficult to follow. With a few minutes until the doors opened, we discovered that our brand new rope had been wrapped in a funny way and needed to be re-wrapped. While this only took 2 minutes, it left us leaving the hut behind everyone else… which on this mountain – makes a world of difference. After fixing the rope, left the hut and had only a guide and his climber directly in front of us – no one else in sight. Within the first 15 minutes, we had temporarily lost sight of the two climbers in front of us. While we had heard that staying on route could be challenging, we didn’t fully grasp exactly why until this moment. In an instant, the person in front of you can step around a corner or eclipse a crest and be completely out of sight – and out of ear shot. Very often you needed to follow a small ledge to find the next point to ascend – and when you’re standing on the edge of a cliff with a several thousand foot drop below you – walking out on a ledge isn’t the most intuitive next step. During the next 4 hours of the climb we found ourselves off the route at least 6 times. At the top of almost every climb we had to scout out the route and hope that we were following the traveled path. Needless to say, this took a LOT of time – and stopping just once to explore our options left us behind the climbers who knew the route (95% of which had guides). But beyond the amount of time it was taking, being “off route” posed some very serious safety concerns. While we were certainly off route a great deal of the time, we kept finding our way back to places that other climbers had clearly been. 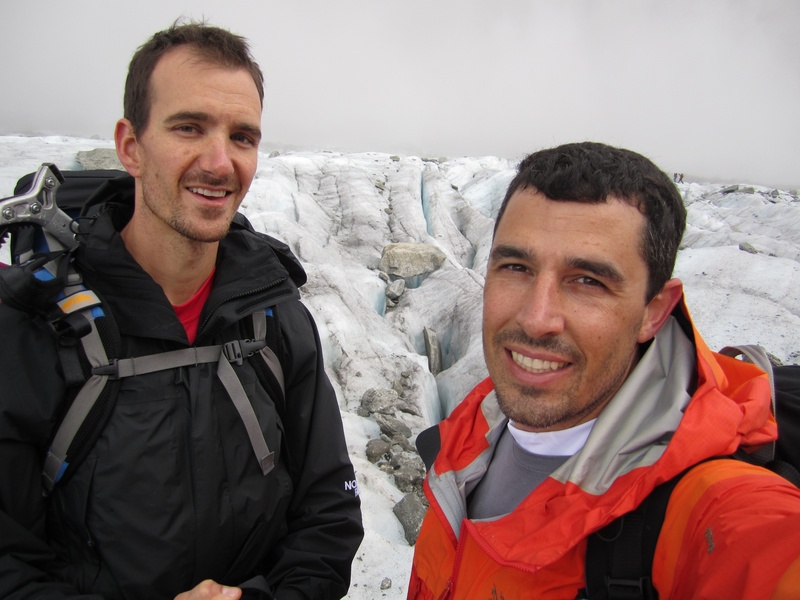 We would find scratch marks in the rocks from crampons, stomped down dirt and occasionally an anchor left in the rock. We were confident we were on the right route at those points – until about 5 hours in… when we found ourselves at the bottom of a couloir in a scree field. A couloir is essentially a funnel on a mountain. All of the loose rock from above end up falling through this passage as it tumbles down the mountain. A scree field is the result of falling rock. It is a collection of all of the lose rock on the mountain – from small rocks to huge boulders. 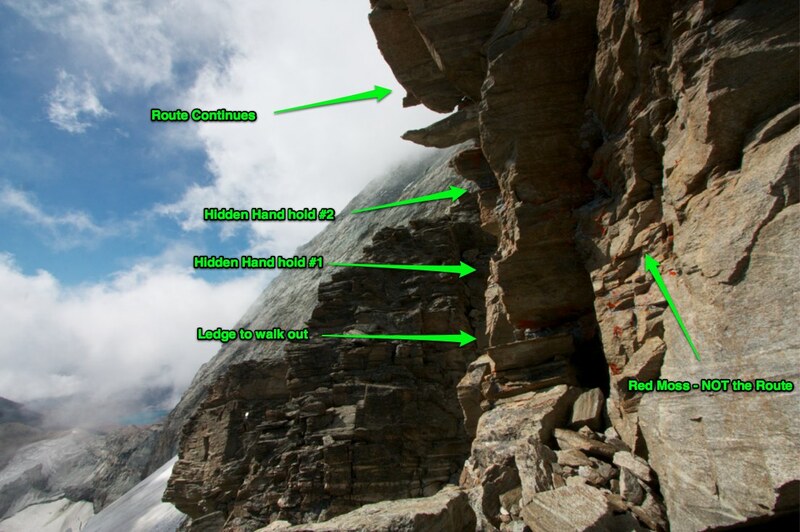 The identifying attribute of the scree field is that none of the rock is stable. Every step is met with a shift in the rock and every time you reach for a handhold, it’s necessary to test how much force can be put on the hold before it moves. After working a few different angles in the scree covered couloir, we found what looked like a secure rock tie onto. We pulled out our xeroxed copy of the route description and read through it yet again. But somehow “look for the yellow-brown rocks next to tower, go L 3 Meters to the chimney and continue up ridge 50 Meters to tower” was not a good enough explanation for us – imagine that. We had been hearing that sound all week in Chamonix – the sound of rock fall; the sound of a very large boulder slipping out of place and falling down the mountain causing a rock avalanche to be released. When you’re tied at half way up a couloir where most rockfall will come blasting down at you obliterating anything in its path, this is NOT the sound you want to hear. Fortunately, in this case we didn’t see any falling rock. With an hour spent on navigating the scree covered couloir, we looked at the clock; it was 10:45AM. We were 5 hours into the climb at this point and way off schedule. If we were going to be able to make the summit at all, we’d need to know exactly where we were going and start moving quickly. 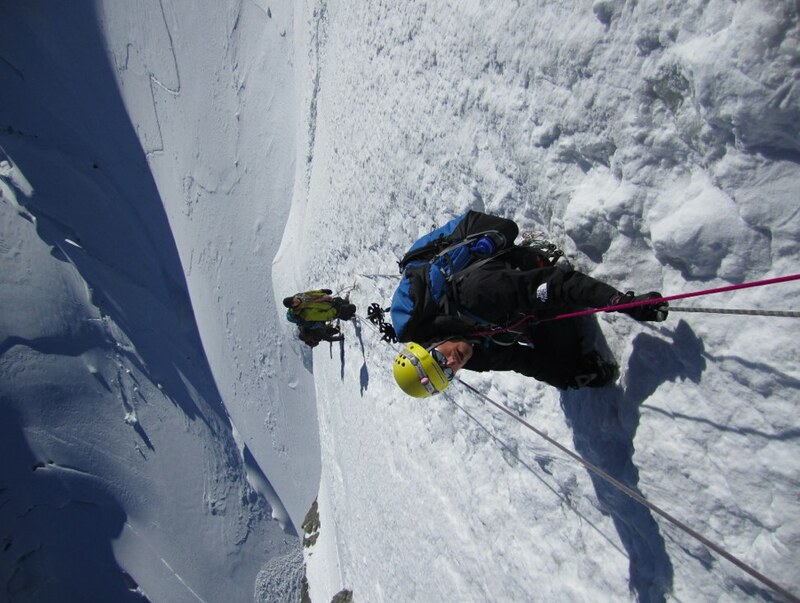 As we discussed our options, a group of German climbers mounted the top of the ridge we were below. 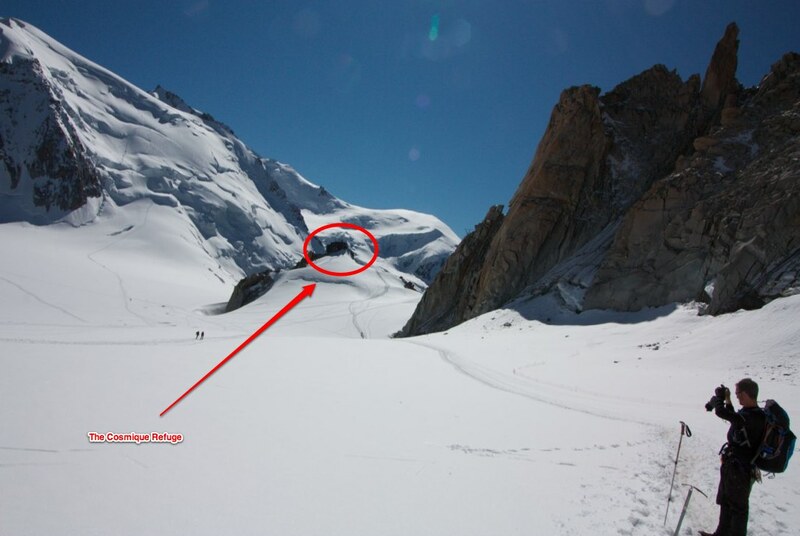 We had heard from climbers at the Hornli Hutte that they got stuck at the top of the mountain the day before and had to stay in the emergency Refuge 75% of the way up the mountain – the Solvay Hut. 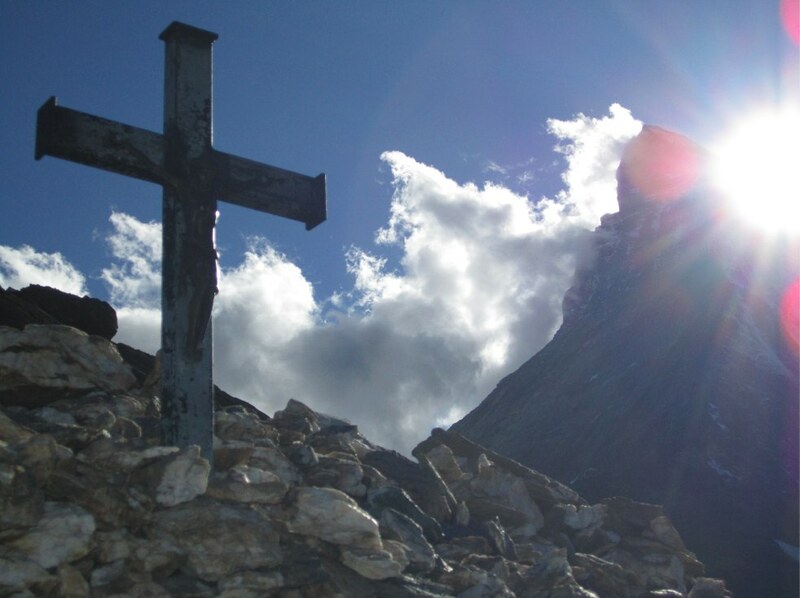 The Solvay Hut is the last salvation for a climber stuck on the mountain after dark. There’s no heat, no water, no sheets, pillows or blankets. It will get you out of the elements if there’s a storm, but won’t help much beyond that unless you have a sleeping bag and food in your pack to get you through the night. The German climbers didn’t seemed too thrilled to be coming down a day late, and they seemed to be a bit worn from spending an entire night at altitude… but they WERE alive and happy to be able to get off the mountain. We were thankful for their presence as they were able to point us to the route! Carl and I hustled up the ridge as fast as we could. The climbing grew steeper as we got higher, but we were able to move much quicker now that the hand holds didn’t move and we had a more secure route to move on. In addition, by this point we were becoming accustomed to the exposure the Mattherhorn presents in the way of shear cliffs and our climbing took on more of a smooth bounding and leaping technique. 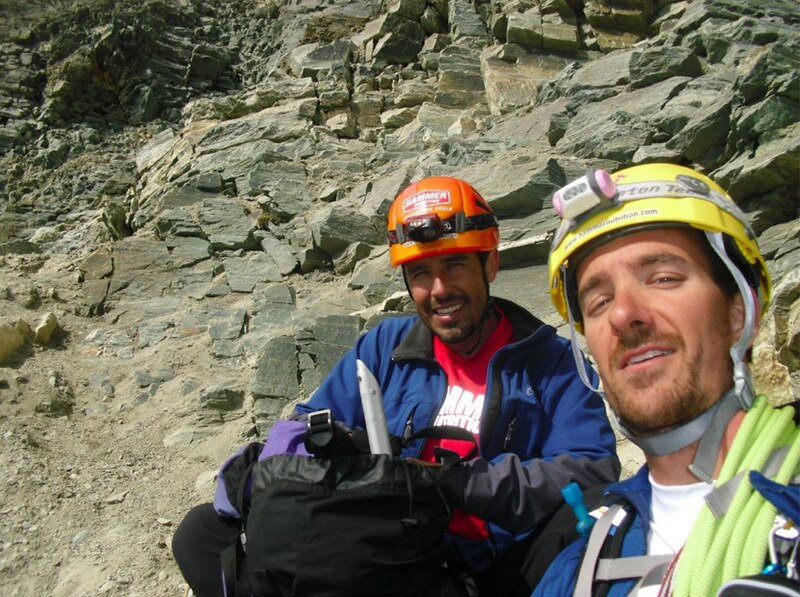 Carl made mention on several occasions that he was blown away by the growth of my climbing skills over the past few weeks, and that it was only because of this growth that we were able to now move quickly on the Matterhorn. Placing less protection and moving quickly seemed to be the choice approach for Carl others who were making timely progress on the peak. 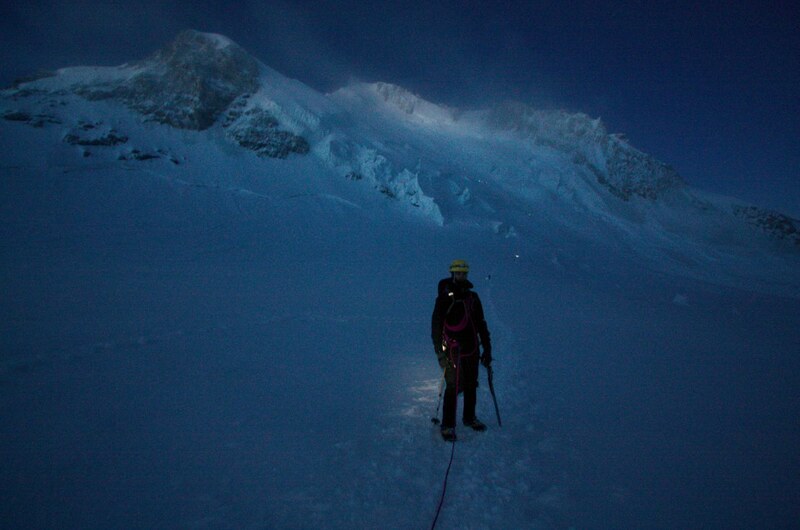 It meant we could move quicker, spend less time in “the danger zones”, and have a chance to rapidly ascend the peak. On the flip side, it meant that Carl could take a 75 foot plunge before there was any chance of the rope stopping him, the same rope I was attached to. In many cases there simply was no place to fix an anchor and I found myself mounting a ledge to find Carl using a body belay to secure me incase I pulled out a rock or slipped while climbing. 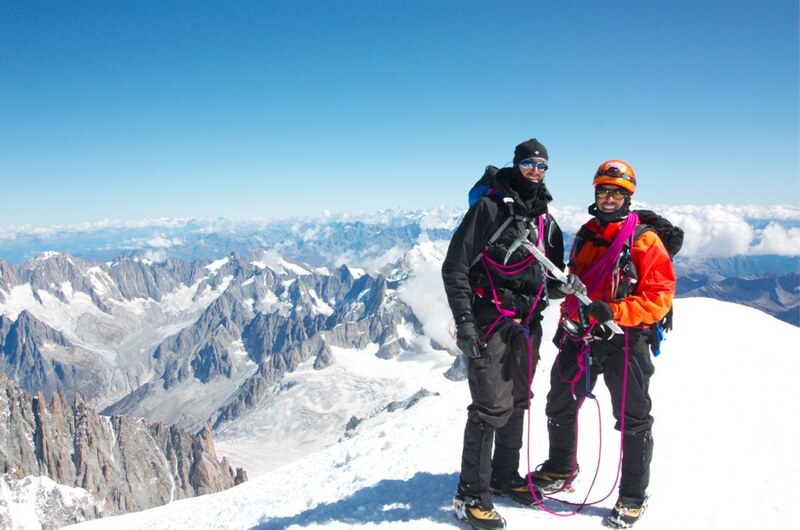 It was of very little comfort to know that if I biffed it on a handhold or foot hold and took a plunge, Carl would be joining me for speedy tumble down the east face of the Matterhorn… but it was the way this peak is climbed. Go fast, go light, or go home. As we got to a bend in the ridge, we could see the Solvay Hut clearly. 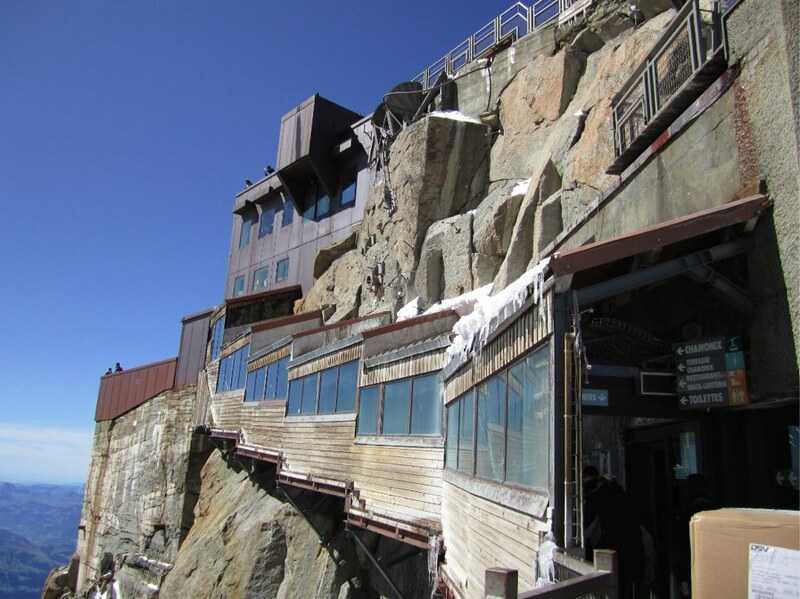 Unfortunately, the ONE valuable piece of information the guidebook DID have to offer: It takes twice as long to get down as it does to ascend – so if you haven’t made it to the Solvay Hut in the first 3 hours, you should turn back. We were now 5 and a half hours in and just approaching the hut. Many climbers we talked to referenced The Matterhorn as as one of “The Most Difficult Mountains to Navigate”. 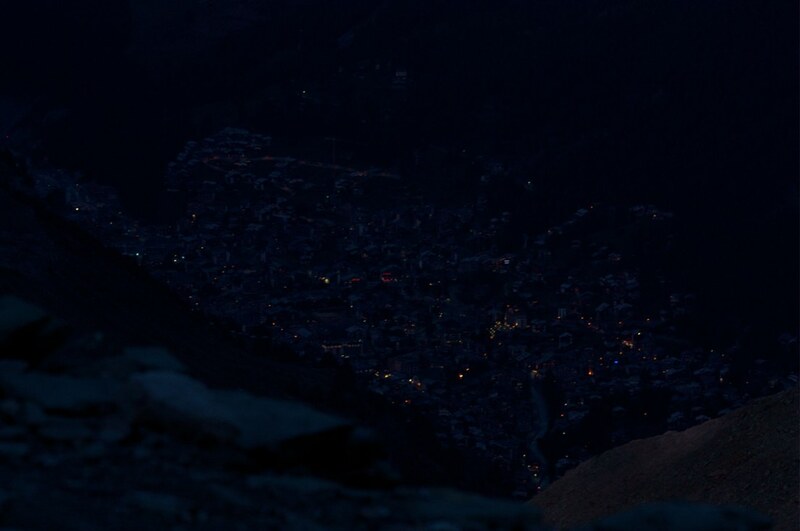 The guides that worked on the mountain said that you can expect to get lost the first 5-10 times you climb it, and navigating after nightfall is the worst decision you can make. We knew that we could stay in the Solvay hut if we didn’t get down before dark, but we didn’t have any sleeping bags or food to get us through the night so it would be a rough 24 hours for both of us. It seemed like a risky move to continue without a clear route past the hut – but we both wanted to push on. As we began to move again, we saw a large cloud front moving in on the mountain. This was the nail in the coffin for us. Moving up the mountain without a clear route was difficult, but trying to navigate through a storm at the same time was a different story altogether. Neither Carl nor I were interested in entering into situation with risks that we could not predict or back out of. Making the decision was not hard, but turning around was. We had set a goal for ourselves, and had gone through all the steps necessary to succeed, but the cards were quickly stacking against us. The challenge at this point was finding the route back down. From the start, this was the challenge we were warned of – staying on route coming DOWN was the dangerous part of the mountain. One of the particularly dangerous parts of the descent was how it was supposed to be executed. 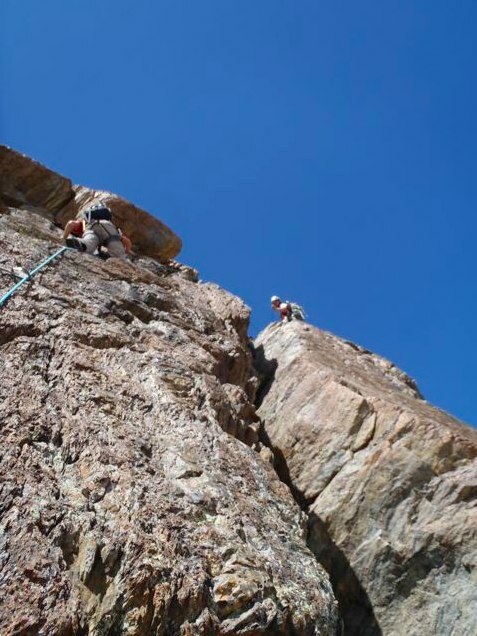 On most mountains, you face the rock for most of the descent and climb down and used fix lines, rappels, or walk offs to descend the mountain. While there are several points on the Matterhorn where you do this, the recommended method for 90% of the decent is to face outward and slide or jump down to the rock below while your partner above feeds you out slack on the rope. This can be a faster way to descend but it is definitely a less secure way to travel, especially for the last climber coming down, which in this case was thankfully Carl. As we made it to the bottom of the ridge we were on (still many hours from our starting point), we stopped for a minute to squeeze some Hammer Gel into our mouths to keep our energy up. This turned out to be fantastic timing as we bumped into a guide and their climber who had made the same decision to turn around. It felt great to have our decision confirmed, but it also gave us a lot of security as the guide knew the mountain well. And as it turned out, the guide actually slept in the bunk next to us when we climbed Mont Blanc. Having a little rapport with this guy was fantastic – and definitely helped the language barrier. We traveled down the mountain at a pretty good pace – only using about half of our rope to get over an occasional ledge. We were moving ahead of the guide, but asked them to point us in the right direction as we climbed. This proved to be amazingly helpful as on at least 10 separate occasions we were ready to head down a different path just before the guide called out behind us and pointed us towards the route. Discussions continued on the hike down about what we learned from the climb. 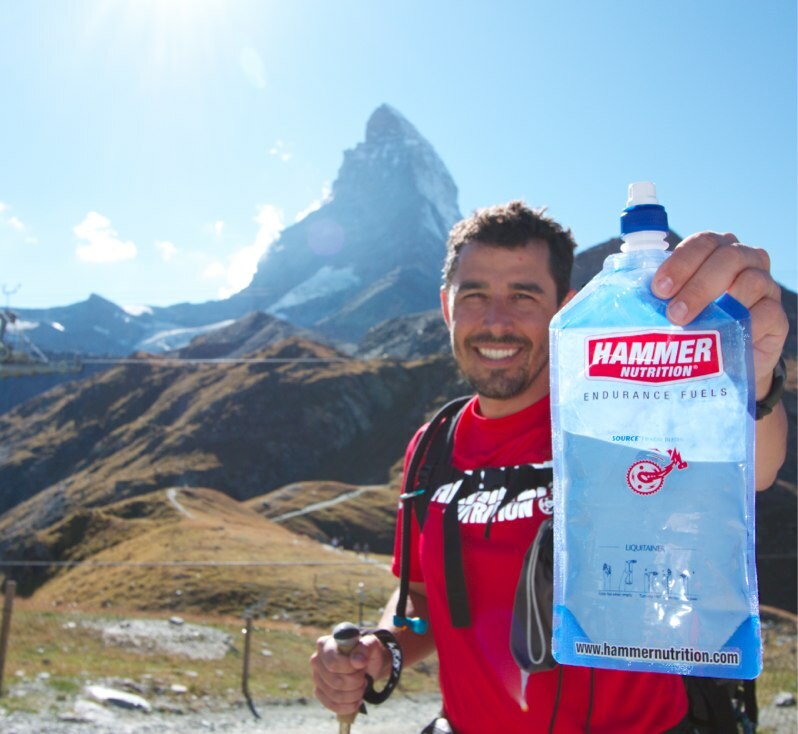 We both expressed our frustration with not having a chance to to summit the Matterhorn – but there was no question that we made the right decision. It’s frequently not the ascent of a mountain that causes fatalities – but the descent after pushing the envelope. Besides, we have another mountain ahead of us and a very small window to climb it. 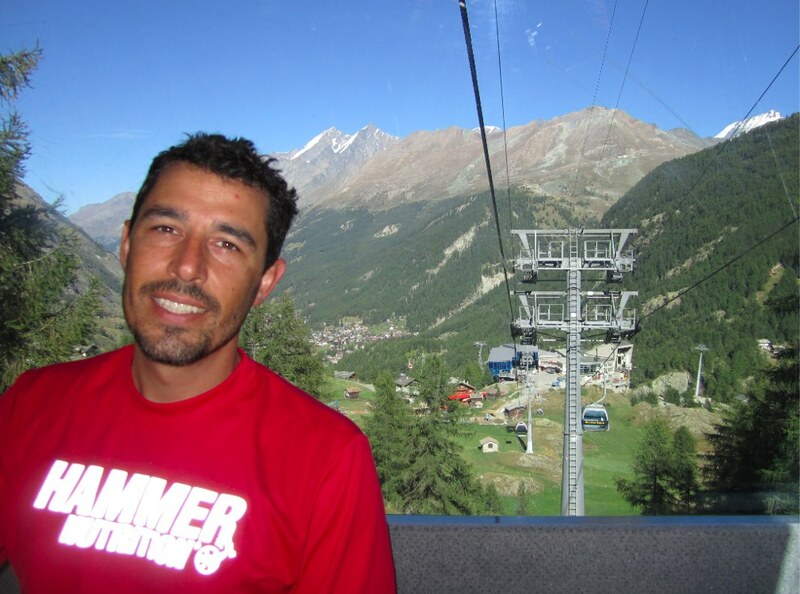 After the long hike and multiple cable cars back to Zermatt, we arrived at our apartment to find a new member of our team – Harlan Turner. Harlan is a great friend who flew in to support the Angel Wings effort and spend time with us as we climbed. We hurriedly packed our things and headed for the train station. 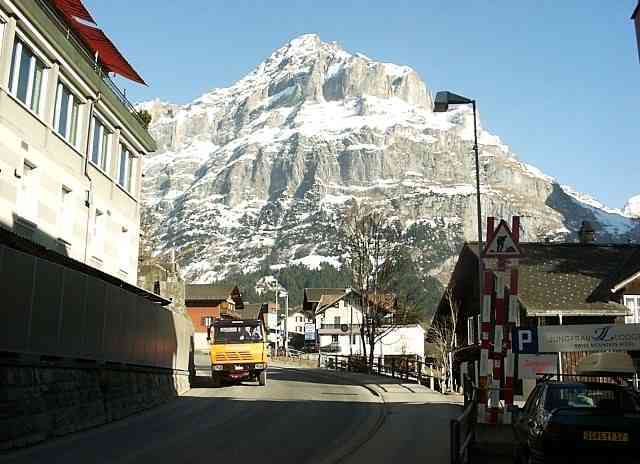 Grindelwald is the home of the most dangerous mountain on our trek: The Eiger. The Eiger stands at 13,065. 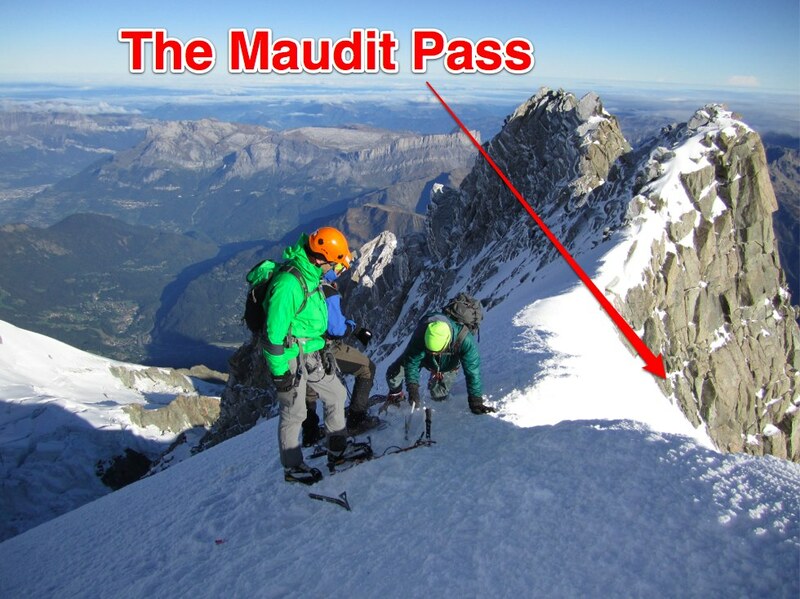 While this is roughly 3,000 feet shorter than Mont Blanc, it is notably more difficult. The North Face of The Eiger has been given a German nickname “Morwand”, the literal translation: Murder wall. We are going to need great weather and a lot of luck on our side to pull this off in the time we have left. There are only two days left before I’ll have to leave Europe and head to New York for a family member’s wedding. We need your help raising money for Angel Wings before that happens. Donate Now. As with the other mountains we have spent time on, The Eiger has a train as well as a lift that takes you up to the starting point for the climb. While the view is great – the train ride alone is 240 EURO (roughly 340 dollars) – PER PERSON. This doesn’t include the hut we will have to stay at or any additional expenses we’d incur. With clouds looming around the rock, the weather is a significant concern. As proven by our other climbs, two days isn’t much time to orchestrate things on the spot. Next stop… climbing shops to map the route, learn the details and look at the forecast. Our Grindelwald experience was enlightening, but very quick. Our first stop to do research was at the town information center. After looking into train tickets and cable car tickets to the highest point they would take us on the mountain, we found a local who knew the other details we were looking for. Not only was the hut we needed to stay in booked for the next several days, but a storm was expected to come in the next day. With only two days remaining before the end of our expedition, a storm completely knocked out our chances to climb this epic beast of a mountain. 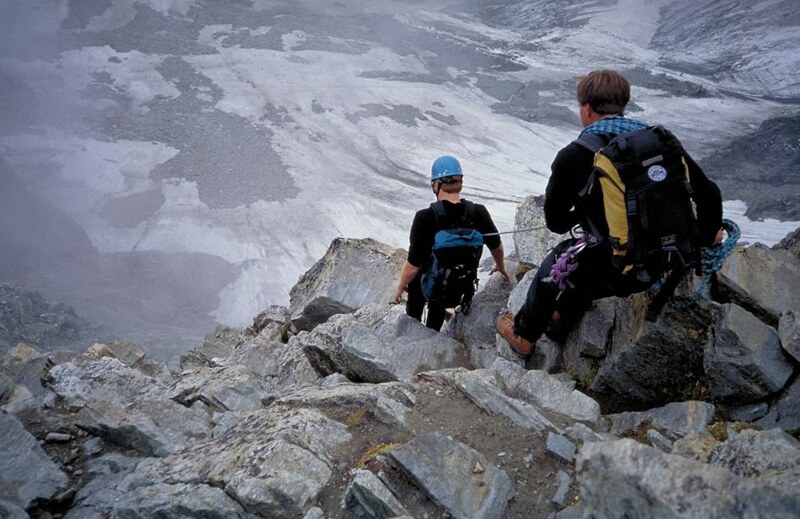 The Eiger has the highest fatality rate of the three mountains we set out to climb. Good weather is a mandatory prerequisite to climb this one. For the last several weeks, I hope you’ve enjoyed following our adventure as Carl and I risked our lives. We both climbed for a variety of reasons, but an important one has been to raise awareness for those whose lives are at risk every day. While we’ve been climbing, 8 of our friends have been in Haiti working with Angel Wings to serve those people. If you haven’t had a chance to yet, please donate NOW and help us help Angel Wings. They are making great strides to erect a hospital and bring medicine to those less fortunate than us – and they can use your help. I hope the money, energy and time that has been put into this adventure and entertaining you for the last few weeks shows the commitment we have to the cause. Now it’s time for our friends and family to step up and help out as well and Every dollar helps. Eating out one less time this month, drinking coffee at home today and carpooling when possible are all very easy ways to find a little extra money for the cause. Please, Donate Today.